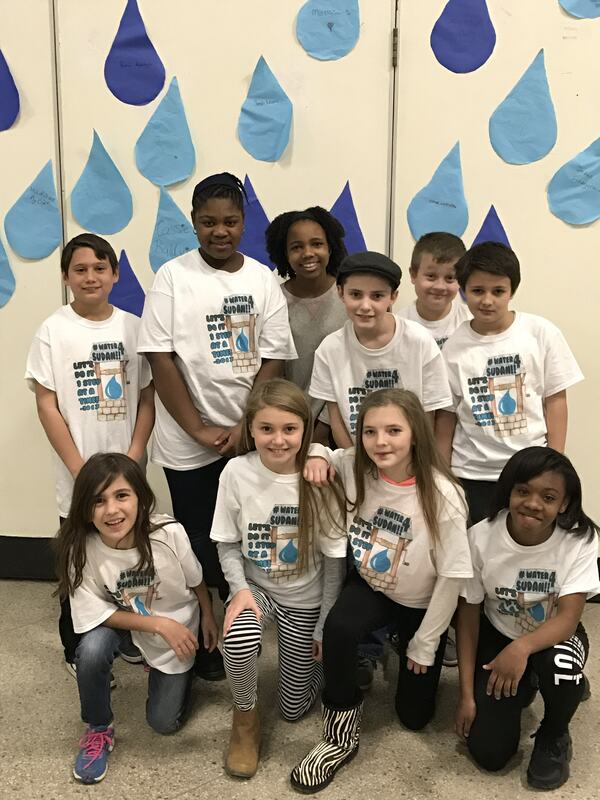 Edgewater Park has a simple motto: it is “a small town with a big heart.” The students and staff at Edgewater Park’s Samuel M. Ridgway Middle School have been putting that motto into practice with their Water for South Sudan project, initiated by fifth graders in 2017. There are two stories at the heart of A Long Walk to Water. One is the true story of Salva Dut, a Sudanese boy who has fled the fighting from a civil war that is tearing his country apart. In the process, he becomes separated from most of his family and has to travel by foot across unforgiving terrain and through hostile territory to a succession of refugee camps. He becomes a leader and helps other children to safety. Dut is eventually brought to Rochester, New York where a family cares for him and helps to reunite him with his own family, most of whom have miraculously survived the conflict. Now a successful man, Dut develops a project, Water for Sudan, to help the people of Sudan gain access to clean drinking water. The other story is fictional, but based on the experiences of countless women and young girls across Africa. Nya is 11 years old. She does not go to school, but spends all day, for seven months of the year, walking to a pond to fetch water for her family. One day, engineers come to her village and begin work on a well that will provide safe, fresh, clean drinking water and eliminate the need for Nya and other girls to work so hard to fetch water. The drill used to dig the well is called an “iron giraffe” by Nya. While the process is slow, eventually the well is dug and, as a result, a school, marketplace, and clinic are also built. These developments make life easier and safer for Nya and her family, and she is subsequently able to attend school. Nya’s experience with the well is thanks to Dut’s Water for South Sudan project. At the end of the book, the fictional Nya and the real-life Dut meet. 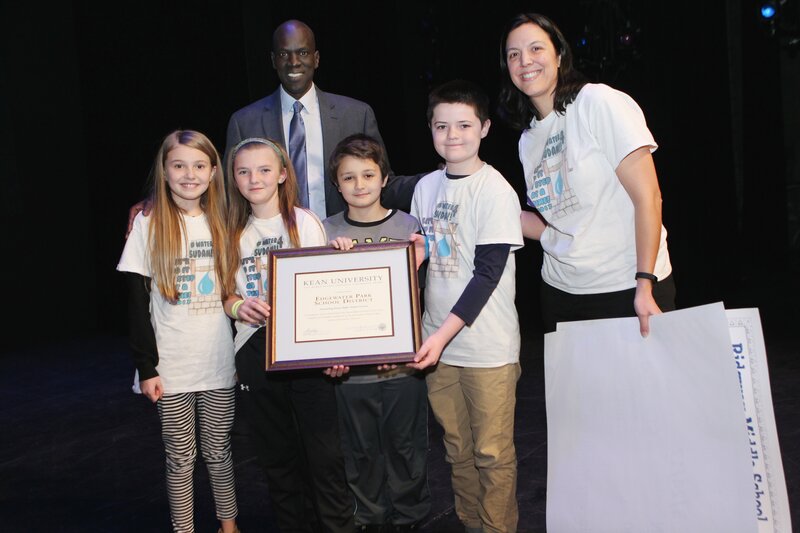 At Kean University in March 2017, Ridgway students met Salva Dut and received the Outstanding Human Rights Student Activists award. Schwartz’s students, who are approximately the same age as Nya and as Dut when he began his journey, were moved by the book. They brought their creativity and energy to the fundraising process, and came up with an ambitious goal: to raise $15,000 to have a well drilled in South Sudan by the time they reach the eighth grade. The students also decided that they wanted to participate in Water for South Sudan’s Iron Giraffe Challenge. The organization’s current drilling rig has been in operation since 2008. This very expensive tool will eventually need to be replaced. In the challenge, schools that raise $1,000 or more are entered into a drawing to win a variety of incentives. First prize is a visit to their school from Salva Dut. Because Ridgway Middle School has been successful in raising much more each year than is required to enter the drawing, they earmark the first $1,000 for the challenge. All other money they raise goes toward the school’s $15,000 goal. “In reality, the students have set a goal to raise $19,000,” Schwartz said. “$15,000 for the well, and $1,000 every year for the Iron Giraffe Challenge. Fundraising that first year began on March 1, 2017; by the time 10 days elapsed they had already collected $1,300. Unbeknownst to the students and staff when they began the project, Dut was planning a visit to speak at Kean University on March 24. 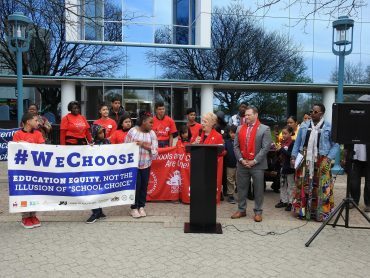 Schwartz registered her students to attend the conference, but when representatives at the university heard what the students were doing, they invited them to meet Dut and take a photo with him. During the third week of fundraising, students purchase blue water droplets. 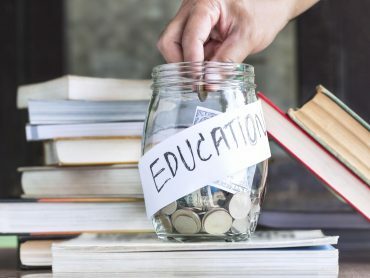 March is the designated fundraising month, and students and staff have created a number of fun and successful fundraising pitches to entice the community to donate. This year the students kicked off the fundraising challenge with a dance. The DJ donated his time and the committee charged 50 cents per song request. The Iron Giraffe Committee donates snacks and drinks. That one event generates about $1,000. The real action comes during the first full week of fundraising when the dean of students volunteers to be taped to a wall. Donations get you a length of duct tape. Only students are allowed to participate. In addition, there is a link on the district website to a CrowdRise fundraising page. Students also designed and sold rubber bracelets that read, “The water can’t wait.” Fifth-grade students created T-shirts and competed for their design to be selected as the winner. During the third week of the challenge, students can buy a paper water droplet, add their names, and tape them to an air wall in the cafeteria. Finally, during the last week of March, students can pay $5 and spend 90 minutes out of class with other students in the cafeteria, hanging out and enjoying snacks and drinks. Student fundraising successes are tallied, earning them bronze, silver and gold “medals” made from construction paper. The medals are displayed at the school until the end of March, after which students take them home. Students who achieve $25 in donations earn a silver medal. 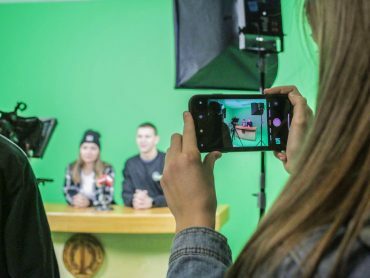 At the $50 level, students earn a gold medal and are given a shout-out in the morning’s announcements. A $10 donation earns students a bronze medal. They have also created two videos, both with the goal of educating students who have not read A Long Walk to Water about the Water for South Sudan project so that they are included in the fundraising initiative. For students in the third and fourth grades, the video introduces them to a story they will read when they are fifth graders. For seventh and eighth graders who passed through fifth grade before the project began, they learn what has made the fifth and sixth graders so enthusiastic to help South Sudan. By the end of March 2017, they had raised $4,315. By the end of March 2018, they have raised $11,184.52. Learn more about Ridgway’s project, watch the students’ videos, track their progress, and donate online at ridgway.edgewaterparksd.org/water-for-south-sudan.